What is your role in this exhibit? What kind of art do you make or support? 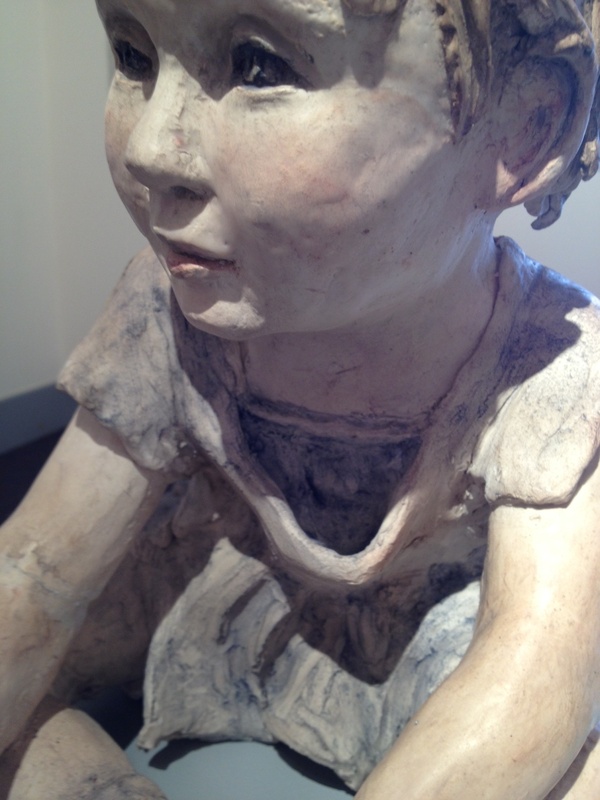 My role is a visual artist…I sculpt inner emotion, conversation and thoughts. I am a sculptor of children. Is making stuff really work for you, or is it play? Why? Why even engage in the arts? Of course in the beginning it was work but as the work progresses it begins to have life and feeling of a real little person. When doing the details I actually pull from within, when I interview the person I sculpt or watch them, I observe the mannerism and try to match that with my work. I thoroughly enjoy my work and I’m excited each day I have to privilege to know the person I’m sculpting. My desire is to convey expressions, thoughts and the true inner person of my subject. In doing so I become a better person. 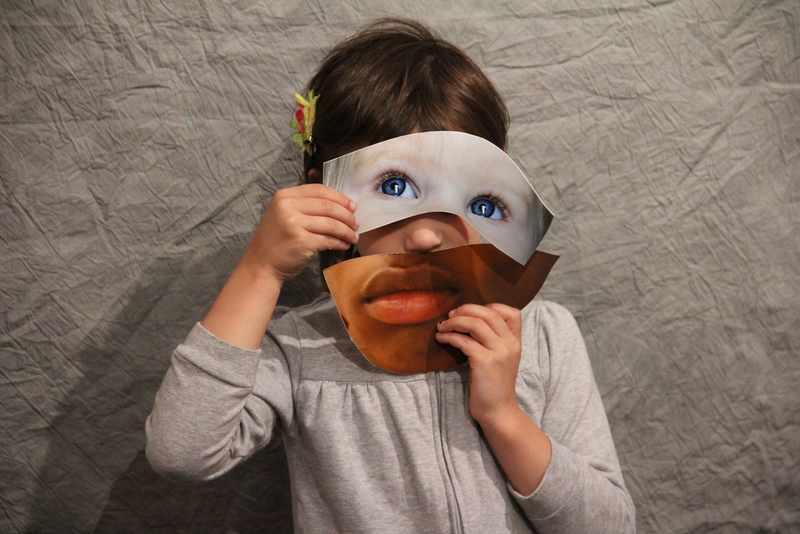 I understand children are important and their story is important by placing myself in their world I can feel what they feel and find the emotions of their reality. Clay is play. What is your perception of the ArtWorkers exhibit and your involvement in it? Invigorating; it is so interactive and there is so much for everyone to feel part of; be it a painting, music, dance or photos it is an experience only one can have if they come. Honestly, I had no idea how in the world this would come together, it totally blows me away by the reaction of the public and the artists involved. Any advice for future ArtWorkers? Dream it make it and enjoy the moment; your art becomes the world’s and enjoy the results. Remember, no one else does it just like you. Composer Stacey Barelos describes this performance as an exploration of a few simple musical ideas often associated with “American” music, in particular, open intervals and modal scales. The improvisatory elements and the continuous rolling accompaniment invoke a pioneering and (perhaps) impulsive spirit often attributed to the stereotypical “American” of past and present. This piece was created and recorded in connection with ArtWorkers, an exhibition currently open at Spiva Center for the Arts in Joplin, MO. ArtWorkers is sponsored by Eagle Picher, LLC with financial assistance from the National Endowment for the Arts, Joplin Visitors and Convention Bureau and Missouri Arts Council, a state agency. Stacey Barelos serves as the musical curator for ArtWorkers and describes herself as a classical piano player and composer, both often existing in more experimental traditions. Barelos leads her audience through simple ways to compose; no music experience required! I am the music curator for the 2013 Joplin ArtWorkers exhibit. I am a classical piano player and composer, both often existing in more experimental traditions. I love to create and when I have the time, this act is “play”, absolutely. Unfortunately, with the state of the arts today, I simply cannot afford to create at will. Creation for me is often a combination of pure creativity mixed in with the push of deadlines. Of course, this only speaks to the creation of new works as a composer. As a piano player, my work is a combination of creator and athlete. I interpret, explore, practice, stretch, practice, practice, practice…perform. Why engage in the arts? We must engage in the arts to continue to create a cultural heritage for ourselves. When we do not do that, our artistic heritage is based primarily on a popular culture not created by the hearts and minds of thoughtful artists but simply by consumer demand. My perception of the ArtWorkers exhibit is a delightful mix of vastly varied and talented visual artists from the region with a bit of the other arts mixed in. My perception of my role is that I’m an organizer and contributor. My advice for future ArtWorkers is to run with your enthusiasm. If you have ideas, get them started early. If you come from a different area of the arts (music, poetry, dance, etc…), and haven’t done a lot of collaborating before, don’t be surprised if the visual art world seems to work in a completely different pace and format than you are accustomed. Just do your thing! 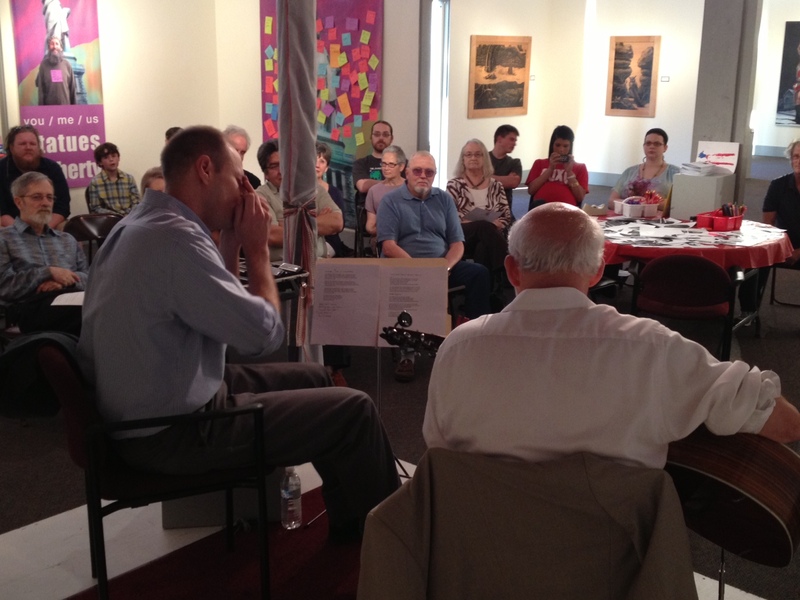 Poets gathered at Spiva Center for the Arts on Saturday, May 25, as part of Artworkers: Creativity and America. 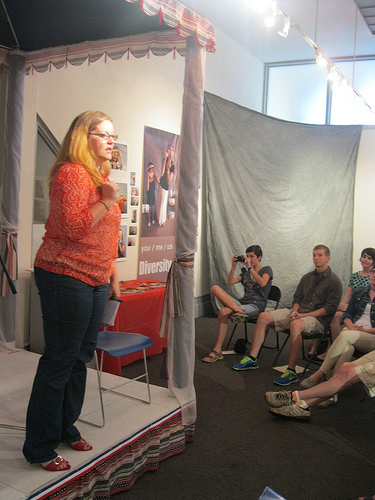 The event, “Body and Word: A Poetry Project,” included poetry readings by Missouri Southern State University students and alumni, Spiva’s artist-in-residence Hugh Merrill, and Spiva gallery/gift shop coordinator Shaun Conroy. Poems were written in response to Artworkers’ themes: America, Americana, nature, ecology, family, politics, monuments, and liberty. Some poems were humorous—one poet discussed bananas and how it seems odd that some are said to take 3.5 days to ripen—while others were more serious. Featured MSSU students and alumni—under the direction of Joey Brown, a professor of English at MSSU—include Natalie Byers, Amelia Carpenter, Madison Pollock, Ruth Stamper, Kristine Steddum, Bailey Stehm, and Peter Thompson. The event also showcased a mannequin dressed in poems written by students in Brown’s poetry class. Poems were handwritten and typed, and a few resembled ransom notes. Students were given two class periods to compose poems in a poetry lab. Prior to the reading, participants and guests were given the opportunity to write poems and post them in Spiva’s main gallery. 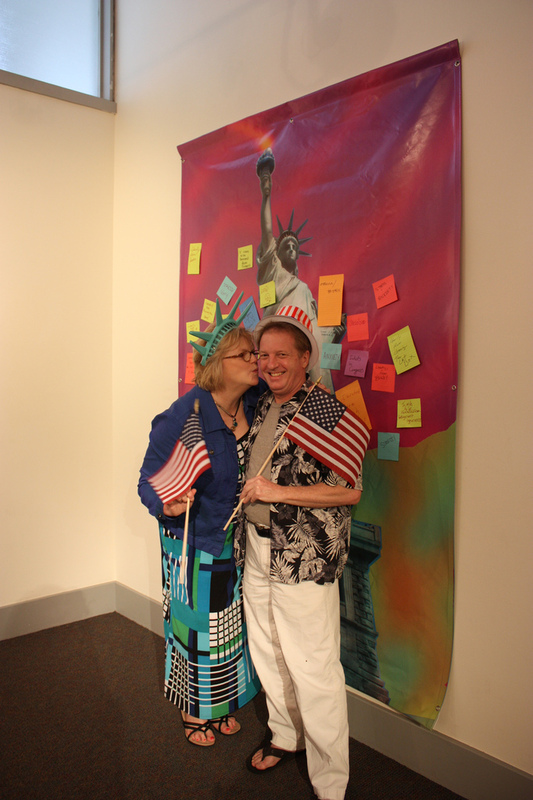 Merrill created this hands-on project, which will continue as ArtWorkers runs through early July. Today and during this exhibition we remember. We remember our families and community two years ago, fifty years ago, and our hope swells for the future. You’re invited to bring copies of family photos for exhibition. Find photographs, letters, postcards, birth certificates, awards, or other cool family memorabilia. Bring them to Spiva and make copies in the gallery. Spiva will display in the Third Street window gallery. Teachers: consider doing the project with your school or class, then bring the kids to Spiva to participate in hands-on ArtWorkers programming. It was a wonderful night of blues in the Main Gallery. 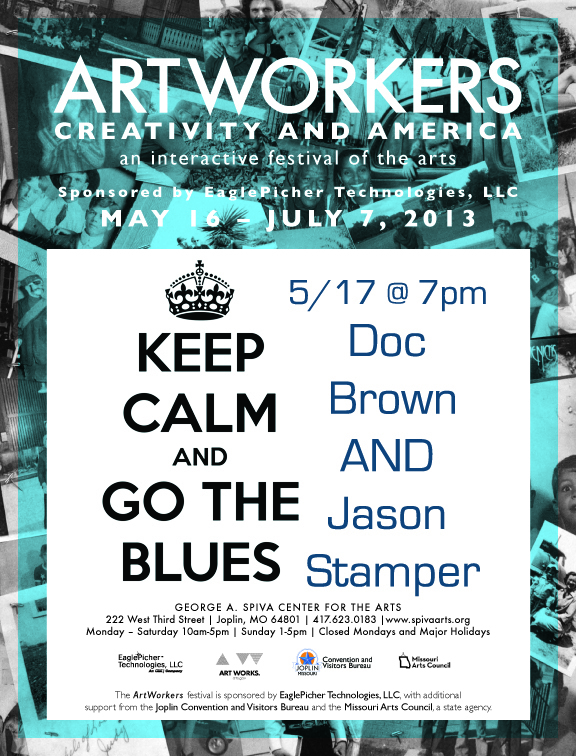 Doc Brown, Professor of Philosophy at MSSU, and Jason Stamper, Adjunct Professor of Art at MSSU and participating ArtWorkers artist, BROUGHT it to the stage Friday night, May 17th. They claimed it was their first time in front of a live audience, but they didn’t miss a beat. 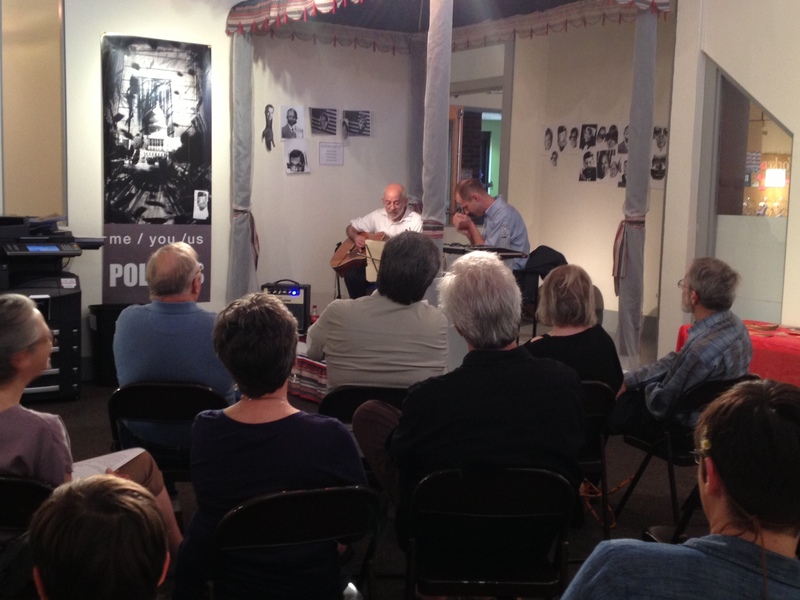 Toes were tapping as music lovers enjoyed this quintessentially American art form, the Blues.